We came across Johan's work on the Woodworkers Institute forum and got in touch with him for this interview straight away. 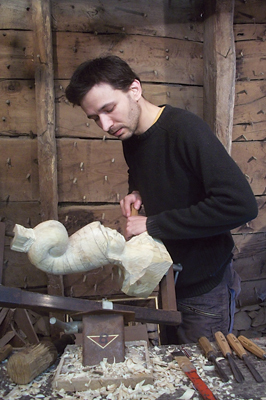 Johan is a wonderful self-taught carver who will happily turn his tools to a variety of styles and subjects. Just a few years into what promises to be an excellent career, we look forward to seeing more from this talented woodcarver in the future. My first experience with woodcarving was in 2005. I had been offered a set of cheap carving tools a few years before by a friend who is a woodturner. I was living in a town that I had no idea where to find wood in, so I grabbed an old chair from the rubbish, fixed it and started to carve ivy stems and leaves in low relief. I didn't realise how bad these tools were before I bought some 'real' ones. Then I thought "OK, I can try woodcarving now!" There is something magical and addictive about carving. It's a fantastic way to turn thoughts or feelings into a concrete, material shape. But what's more interesting with wood is that you can't treat it like an even, homogeneous material. Each piece gives its own specificity to the final result and you have to deal with this during the carving process. How did you learn to carve? I've been drawing for a long time, first in the margins of my school notebooks. Carving came as a third dimension to add. After years trying to transcribe depth on a flat surface, it was like grabbing a drawing out of the paper to set it into the wood. But it's not always easy - I still learn from practising and making experiments and mistakes. Harmony and balance. I like smooth curves and sharp angles. Nature is a great source of inspiration to me. 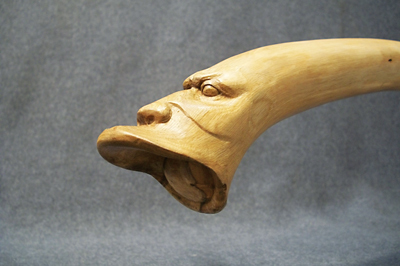 I'm also influenced by other carvers' work, old or contemporary, as well as design and graphic arts. While I'm carving, I spend a lot of time thinking about what is going wrong. It's such an achievement when I get the shape I was searching for. As I mostly worked on commissions last year, I'm trying to make some more personal carvings in order to show my work, but I'm still exploring styles. I'm currently working on stylised shapes. I just finished a manta, playing with the transition from concave to convex, and, at the moment, I'm working on round-shaped birds. Which tool could you not be without, and why? I could hardly choose only one tool! The bench is progressively invaded by each tool I need. So I would say my hands. Despite my usual caution, I've been injured by the bandsaw before and it reminded me just how much you must take care of your hands. What is your favourite style of carving to do, and why? I enjoy carving leaves and plants, in any style. It may have been my first contact with woodcarving, using the Gothic and Baroque traditional styles found on old buildings or in churches. It can be more stylised or realistic, but I like its gracefulness and like to try to make it look fluid and thinner than it really is. What has been your biggest achievement and what piece are you most proud of? Surprisingly, the biggest would be my first commission in a coffee house, as I still had my very bad tools and had to work on a staircase that was positioned already. I feel it's an achievement as the customers used to think the carvings had always been there. The piece Iâ€™m the most proud of is much smaller. 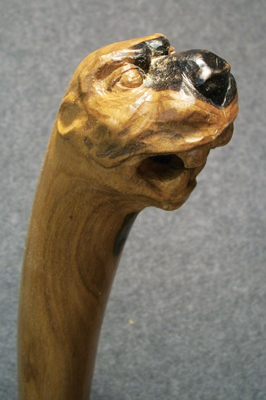 It's just a boxwood (Buxus sempervirens) hair stick, inspired by a sketch by Mucha. Any small mistake would have been so obvious I really had to be precise with this one. I think about Ian Norbury, Gehard Demetz and Christian Renonciat. They all carve in a realistic or hyper-realistic style, in their own way, and their work is amazing. I saw the carvings of Renonciat in a gallery a few years ago. It was so surprising to find pieces of torn cardboard carved in wood - I couldn't believe it! It's something I wondered for a long time and haven't got the answer yet. I just hope I wouldn't stay in an uninteresting job for stability. There is wood, whatever direction I turn my eyes. My workshop is in an old barn. All around I can see the timber frame and the roof batten all covered by the dowels that hold the local thick slates on the roof. As the place is cold and not very bright in the winter, I sometimes carve in a storeroom in the house. Through the window I can see the opposite hill with its ruined castle on the top, surrounded by the woods. Anyone who will be pleased with the result. 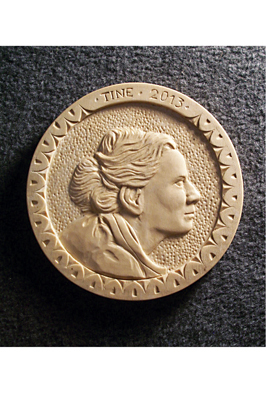 When I work on a commission, and entrust a carving, the reaction I get back is important to me. I remember a man who told me he didn't expect that much - it made me very proud and happy. What do you listen to while carving? I listen to music quite often. Many styles but mostly instrumental, not songs usually. Classical, blues, dub, electro... I'm quite eclectic. I play guitar, and have been trying to learn church organ for a few years. I restored an old reed organ from my grandfather. Once it was working I thought I had to learn to play... One more reason to take care of my hands. I also like gardening and walking. 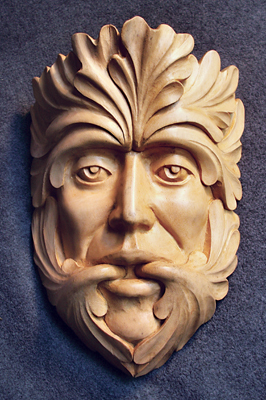 Do you communicate with many other carvers in your area? There are a few nearby. The closest I know is about 15km from my place, and I meet him from time to time. I know there are a couple I haven't met yet. I also communicate through forums on the internet. It's great to share experiences and to see what people are carving here and in the rest of the world. What is your best piece of advice to other carvers? Try to exercise both your hands and your eyesight! If you don't clearly know what you want to carve, you won't get the results. Pick up your copy of Woodcarving magazine today!